I can’t believe that Thanksgiving is right around the corner! As I’ll be posting my fave tried and true meals for the holiday, I wanted to post a seasonal recipe that didn’t encroach on my Thanksgiving extravaganza. So I created this tasty autumnal dish. I love ravioli but didn’t feel like making dough from scratch. So instead, I used dumpling wrappers, which I’ve become quite adept at using since I cooked vegan gyoza. All I did was place two wrappers together with the filling inside. I like my ravioli a little crispy, kind of like pierogies or dumplings, so I fried them a bit too. Feel free to use won-ton wrappers instead. I haven’t been able to find any vegan versions though, hence the reason I used these non-dairy dumpling wrappers which I purchased at Super 88, an Asian market in Boston. The filling is rich and robust; the warm sweetness of the cinnamon and brown sugar counter the bitterness of the pumpkin. In creating a sauce, I wanted a creamy sauce mild enough to not compete with the heartiness of the pumpkin. This pine nut cream sauce fits the bill. Pine nuts are ridiculously expensive (seriously, $10 for 4 ounces…highway robbery!) but well worth it. In addition to this recipe, I use them in pesto and romesco. Adding ground pine nuts thickens sauces making them nice and creamy…no dairy needed here! With pungent thyme and white wine, this sauce tastes even better the longer it simmers as the flavors marinate. In a small bowl, mix pumpkin puree, brown sugar, cinnamon and thyme. Lay dumpling wrappers on a cookie sheet. Pour a small glass of water. Scoop one spoonful onto the center of each dumpling wrapper. Dip your fingers into the water and line the rim of each wrapper with water. Place a second plain wrapper on top of a wrapper with pumpkin filling. Press edges together tightly. In a small saucepan, bring water to a bowl. Place ravioli into water. Cook for approximately 3 minutes until they float. Remove from water with a slotted spoon. Serve with sauce. In a small saucepan, heat olive oil on high. Add minced garlic and cook for approximately 2 minutes until they begin to brown. Grind pine nuts in a food processor until they look like bread crumbs. Add ground pine nuts, non-dairy sour cream, veggie broth, wine and thyme to garlic. Reduce heat to medium and simmer for approximately 10 to 15 minutes. Add salt and pepper to taste. Serve with ravioli. 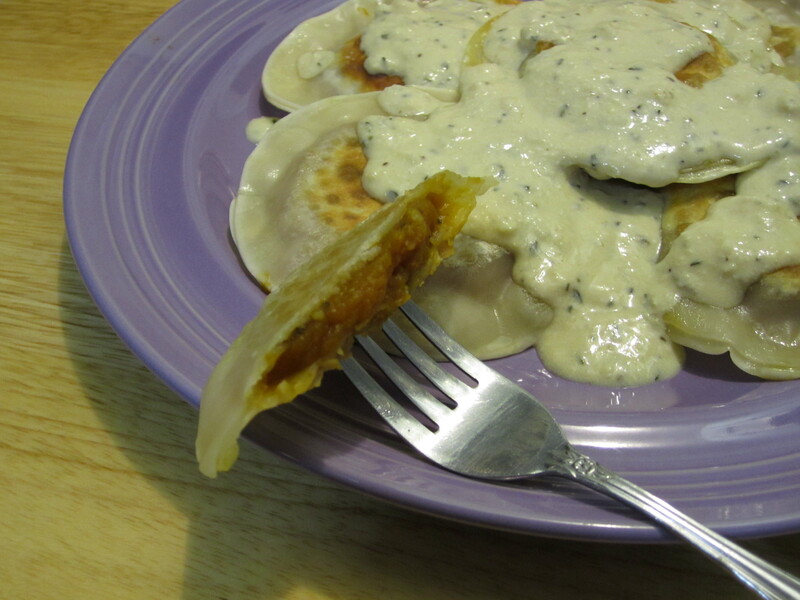 Dumpling wrappers as ravioli, you are a lateral thinking genius! Do not use thyme! It ruins the whole dish!! Well, that’s your opinion. I happen to think the lemony, peppery thyme provides a wonderful depth of flavor to the dish.